The landscape along the coastline's twisting roads is vintage fishing-village Newfoundland. Many visitors make day trips to the peninsula's sights from St John's, which is easily doable. St.John's is North America's oldest city, it sits on the steep slopes of a snug and sheltered harbor. With jelly-bean-colored row houses lining the hilly streets, the city begs comparisons to San Francisco – though in miniature. Many visitors take advantage of the city's excellent dining and lodging options by making St John's their base camp for exploring the Avalon Peninsula. Cape Spear, Witless Bay Ecological Reserve and Ferryland are among the easy day trips. Four of the province's six seabird ecological reserves reside in this region. Included: Accommodation, transportation, whale watching excursion(s), snacks and water during the day. Not Included: International airfare, all meals, items of personal nature, gratuities, laundry, travel insurance, anything not listed as included. Day One Events: You will be landing in the morning at St.John's Airport (YYT), this will give us the afternoon to visit the most Eastern point of Canada. Cape Spear offers some great photographic opportunities, with a stark white lighthouse, that pierces a sky swirling with seabirds atop a craggy headland. Cape Spear Lighthouse is the oldest surviving lighthouse in Newfoundland and Labrador, offering a glimpse into the lives of 19th century lighthouse keepers and their families. From the craggy cliffs, you will overlook a vast expanse of indigo ocean where you may be able to watch an iceberg glide by, or perhaps view a misty spout from a humpback whale. We will be staying in downtown St.John's this evening. Day Two Events: First breakfast and then we will be heading out for our first private charter for a whale watching experience. Our Captain is a knowledgable local guide and naturalist for over thirty years, striving to deliver the most exciting photographic opportunities. Our tour will be completely private so we have the whole boat to ourselves. We will be entering into Witless Bay Ecological Reserve, comprised of four small islands this reserve is one of nature's greatest wonders. 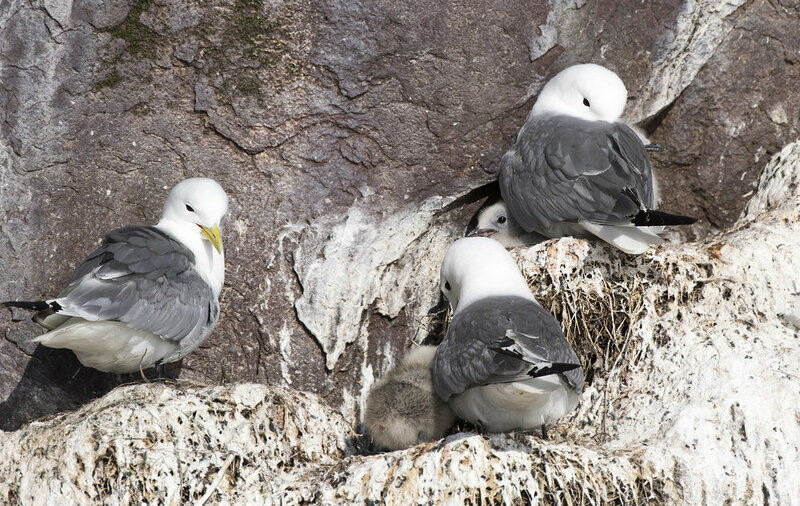 In summer it is home to millions of seabirds that come to shore to nest and raise their young. We have the possibility of viewing Murres, Black Guillemonts, Gulls, Gannets, and thousands of Puffins. 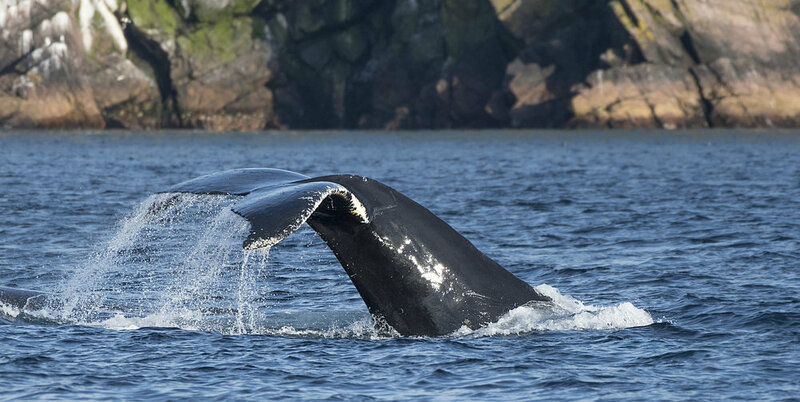 Whales swim in these capelin rich waters as well, you have the possibility of viewing humpback whales and minke whales. After our morning shoot we will all go for lunch and talk about how our morning shoot went. Afterwards we will be clearing our memory cards and getting ready to go back out on our second private charter. Shooting in the evening light offers the west side of the island to be lit up with nice low lying sun on the birds. This will be where people are quite and shutters hammer away as the close encounters with Razorbills and Puffins will be sure to fill your portfolio. After our day of boat tours, we will head back to our place in downtown St.John's for some dinner and a recap of the day. Day Three Events: If you didn't get enough from yesterdays shoot we are about to do it all over again. This time we will skip some of the scenic location shoots and get right to business. The best part about having a private charter is we get to shoot in prime light. Our captain will get us on humpbacks right away so you can get more pictures, video and memories to last a lifetime. After our morning shoot we will go for a drive south, this location is well known for moose so we will be checking out a location that has had good luck in previous years. I'm not sure about you but I'm hungry! Lets go have a late lunch and converse like fellow photogs do. Today we are going to head out a bit later in the evening for our last private charter with what some of my clients call the best captain in Newfoundland. The low light tonight should give us the best golden light opportunities to work with the light and back light some of our subjects. After our boat ride we will say goodbye to our captain and head back for dinner. Day Four Events: We are getting up nice and early as we have a long day ahead of us. After a quick bite to eat and a coffee stop we will be going to Cape St Mary's. 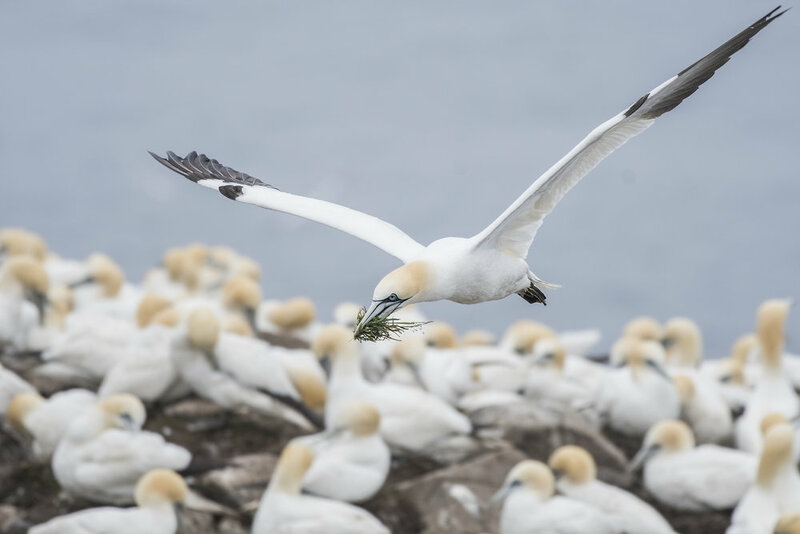 Here you will have the opportunity to photography Newfoundlands largest Northern Gannet Colony along with many other types of sea birds. After our day here we will be heading off to our next accommodations. The themed rooms at our next location always have clients checking each others rooms due to the amazing decor and thought gone into each room. Day Five Events: After a healthy breakfast we will be heading out on a private zodiac tour, in the beautiful Trinity and Bonavista Bay areas. On the hunt for icebergs and the best whales that the area has to offer, possible viewings include fin, humpback, sperm, minke, and although rare orcas too. 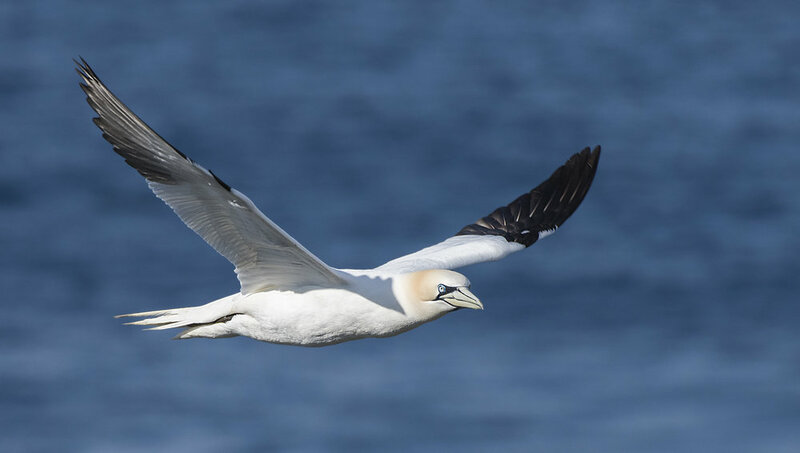 While on the coast, eagles and offshore sea birds including puffins and northern gannets can be spotted. We will be heading back to our inn to recharge our batteries and clear off our cards. After dinner tonight we will be heading out to photograph puffins in Elliston for some nice sunset light. Some evenings the puffins will land within feet of us so be ready for possible close encounters! Day Six Events: This will be our last day for our boat tours. We will be joining the same Captain again, to tour the waters along the Bonavista peninsula on the lookout for marine life. Every boat tour offer new and unique viewing opportunities. You never know what we will see as I may have a surprise for you today! 😉 After our outing we will stop in the Trinity area, as we eat some lunch it is possible to watch humpbacks swimming in the bay right before your eyes. Never think at any point in this trip it is not possible to see whales, moose or black bears as wildlife is rich in these pristine lands. Tonight we will see how the group feels after dinner at out lodge, if everybody is tired we may just do some editing and call it an early night. If the sun is right and you feel like some more puffin shots we can head back out to Elliston for another sunset shoot. Ready to photograph coastal wildlife along the shores of Southern Newfoundland, click the button below!